Accurately and quickly assessing the scale of damage following a disaster has been difficult in the past, but, with a new resource recently released by EDEN member institution Penn State Cooperative Extension Service, that task has been made much easier. The project was led by EDEN immediate past chair Dave Filson. Other team members were Tom Ball, Tommy Bass, Stephen Brown, Michael Bush, Scott Cotton, Rebecca Csutora, Mike Hunter and Marilyn Simunich. 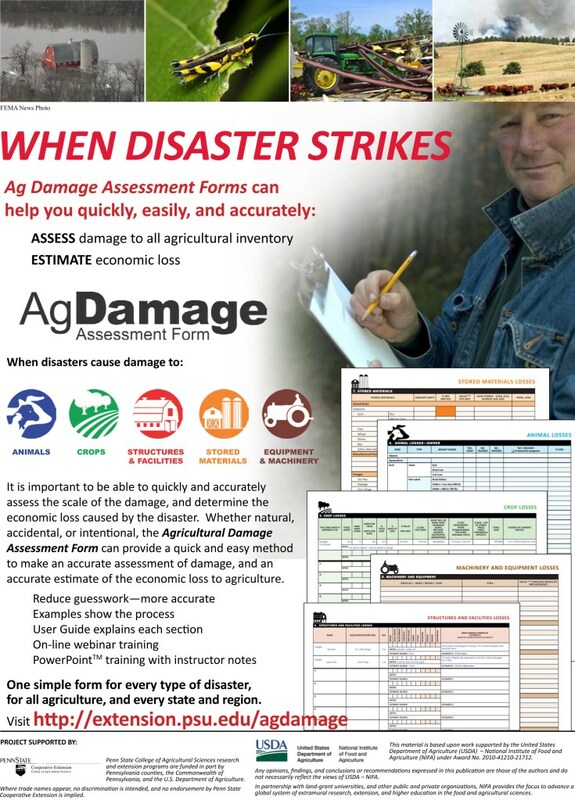 The Ag Damage Assessment Form provides individuals with a standardized method for determining the extent of damages to agricultural commodities and structures. The form provides space to record details needed to determine the exact location and the scale of loss and damage. The Ag Damage Assessment Form includes sections for agricultural losses, including: animal and crop/plant commodities, structures, stored materials, and machinery and equipment. If losses occur for agricultural items not listed, “other” spaces are provided to add/describe additional losses. PowerPointTM training with instructor notes. One simple form for every type of disaster, for all agriculture, and every state and region. Visit http://extension.psu.edu/agdamage to access and download all the resources.